Dangerous premises result in the injury or death of millions of Americans each year. Property owners and managers have a legal duty to maintain their premises in a reasonably safe condition for guests, customers and others who are lawfully on their premises. Yet, structurally unsafe buildings collapse on hazardous construction sites, unsafe pools result in drownings and defective walking surfaces cause store or restaurant customers to slip or trip and fall. Each day, many individuals in Florida who are exposed to these hazards suffer a major injury. Similarly, shopping malls, gas stations, ATM’s, hotels and housing developments where criminal activity is known to occur fail to employ basic and reasonable security measures to protect their customers or guests from violent crime. Unfortunately, these are just a few examples of land or business owners subjecting visitors to needless and preventable dangers that cause often devastating harm to Florida’s families and visitors from around the world. Hazardous premises result in a wide range of often life changing injuries to Americans of all ages. Older Americans, for example, are particularly vulnerable to falls, especially when they are exposed to unsafe and improperly maintained walking surfaces. In fact, each year 2.5 million senior citizens are treated in hospital emergency rooms for fall injuries. But people of all ages are at risk for falls when they encounter unsafe premises and one out of five falls causes a serious injury such as a broken bone or a head injury. In fact, falls are the most common cause of traumatic brain injury. Property owners and managers are not automatically liable for injuries that occur on their property. They can, however, be held legally accountable when their failure to exercise reasonable care in the maintenance and operation of their property causes injury to others who were lawfully on their premises. Premises owners and operators can be made to pay money damages to compensate injured parties when the owners/managers have created a dangerous condition on their property that causes injury. Where the owners/managers did not create the dangerous condition but knew or should have known of its existence and yet failed to eliminate it or sufficiently warn visitors of its existence, the property owners and managers can be held responsible for the harm that these hazardous conditions cause. Each year, dangerous premises result in deaths, brain injuries, serious fractures, shootings, stabbings, assaults, drownings and exposure to toxic substances. When you or a loved one has suffered harm due to unsafe premises, it is essential to have the best possible legal representation available to ensure that you and your family receive not only justice but also the maximum compensation possible under the law. 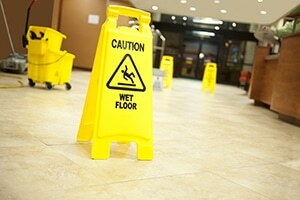 Wet Floor The premises liability lawyers at Boyers Law Group have won many millions of dollars for clients in a wide variety of cases involving dangerous premises. We care deeply about our clients. BLG lawyers know that our clients are depending on us to use our skill, extensive experience and commitment to superb advocacy in order to hold wrongdoers fully accountable for the harm that they cause. So, if you or someone you care about has suffered serious injury due to carelessly maintained or negligently operated premises, call the Miami Premises Liability Attorneys at Boyers Law Group for a free consultation today. When you or your loved ones are injured due to the negligence of others, you need a true champion to advocate for you. You can reach Your Boyers Law Group at 800.545.9100.